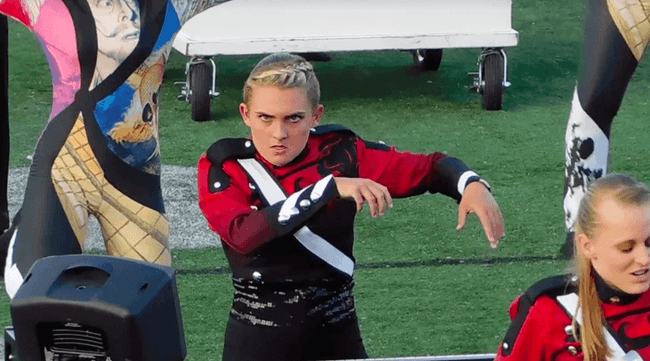 No one knows passion more than this enthusiastic keyboard player from the Boston Crusaders Drum and Bugle Corps. While performing, she the let the music consume her and overnight, she became an internet sensation. We all know that feeling you get when you become one with the music, it’s overwhelmingly powerful. Your heart starts to pound, your eyes get all crazy and your body just begins to flow. I’m sure we can only imagine what we look like. Probably much like this girl. Uploaded just a few short days ago, the video has already received over 1.9 million views and obviously people had some things to say about her piercing eyes and crazy facial expressions. Redditors even joined in on the conversation and hype by commenting that this style of performance is actually pretty common for drum core performances. Check out this thread to read more about a band girl who really loves her job. A redditor claiming to be her brother even chimed in sharing that it’s always been a dream of hers to perform. I’m sure everyone would agree that this is definitely the face of living your dreams.